Josh Gordon trekked to the Browns facility Saturday complaining of hamstring trouble, per NFL.com’s Ian Rapoport (on Twitter), and that’s resulted in the team ruling him out for Sunday’s game against the Saints. Gordon did not travel with the Browns to New Orleans. This escalated rapidly. Gordon was expected to suit up in Week 2 after playing in Week 1. But the receiver with a notorious penchant for unavailability was slow to return from his latest hiatus because of hamstring pain. Cleveland will attempt to stun New Orleans without him, and Gordon will miss yet another game. After Sunday, the 2013 All-Pro will have missed 55 of the Browns’ past 66 games. From a player who’s struggled to a historic degree to stay on the field to one whose voluntary absence has generated one of the most unique holdouts in NFL history, here’s the latest from the AFC North. The Steelers took Le’Veon Bell off their depth chart this week and barely anything came out of this saga this week. The running back remains absent from his team and will miss out on another $853K game check, Adam Schefter of ESPN.com tweets. Bell will have lost $1.7MM by the end of Week 2. This preservation-based holdout has generated concerns from around the league, and even if Bell limits himself to a half-season’s worth of work or less, he will still go into free agency with far more carries than typical running backs seeking second contracts do. Bell has 1,229 totes already, and that’s with him missing 19 career games. By season’s end, assuming he returns, that number figures to reside around at least 1,400. Seeking a Todd Gurley– or David Johnson-level pact is complicated by the fact those younger backs have 1,244 career carries combined. Ben Roethlisberger‘s full practice Friday probably gave this away, but he is slated to play Sunday. ESPN.com’s Diana Russini tweets the 15th-year Steelers quarterback will suit up against the Chiefs in Week 2. An elbow injury cropped up and caused Big Ben to miss Pittsburgh’s Wednesday and Thursday practices, but he’ll be back for a key AFC matchup. With Roethlisberger in the lineup, the Steelers — counting 2016’s divisional-round win — have beaten the Chiefs six straight times dating back to the 2011 season. Kansas City’s one win over Pittsburgh this decade came in 2015 with Landry Jones at the controls. Joe Mixon underwent knee surgery and is set to miss between two and four weeks of Bengals action. The surgery involving a small particle in Mixon’s knee being removed went well, Katherine Terrell of ESPN.com reports. This would explain the positive outlook the second-year running back’s received. 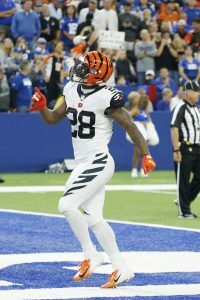 Bengals brass initially feared Mixon would miss up to six games. Joe Mixon has already undergone surgery to repair a recent knee issue and will be out for a bit. However, the Bengals running back received some good news on this front. A two- to four-week timetable now exists for Mixon’s recovery, Ian Rapoport of NFL.com reports. But the Bengals’ initial expectation was for their starting running back to miss between four and six weeks, per Tom Pelissero of NFL.com (on Twitter), so the second-year player encountered a less troublesome setback than initial fears indicated. It’s possible, with the Bengals on a mini-bye because of their Thursday-night assignment, Mixon could miss merely one game — Week 3 against the Panthers — according to Rapoport. That might be pushing it, however, given the team’s worries at this process’ outset. The Bengals face the Falcons in Week 4; both of these upcoming NFC South contests are road games, however. Cincinnati then hosts Miami and Pittsburgh in Weeks 5 and 6. Mixon injured his right knee in the Bengals’ Week 2 win over the Ravens. He’s off to a strong start, rushing for 179 yards (4.7 per carry) and a touchdown and totaling 57 receiving yards on just six catches. Passing-down back Giovani Bernard figures to see the bulk of the work during Mixon’s absence, just as he did when Mixon missed time in December of last year. UPDATE: Mixon will have a procedure to remove a “small particle in his knee that was dislodged Thursday night” on Saturday according to Adam Schefter of ESPN (Twitter link). Schefter notes the operation is expected to sideline Mixon for just two weeks. 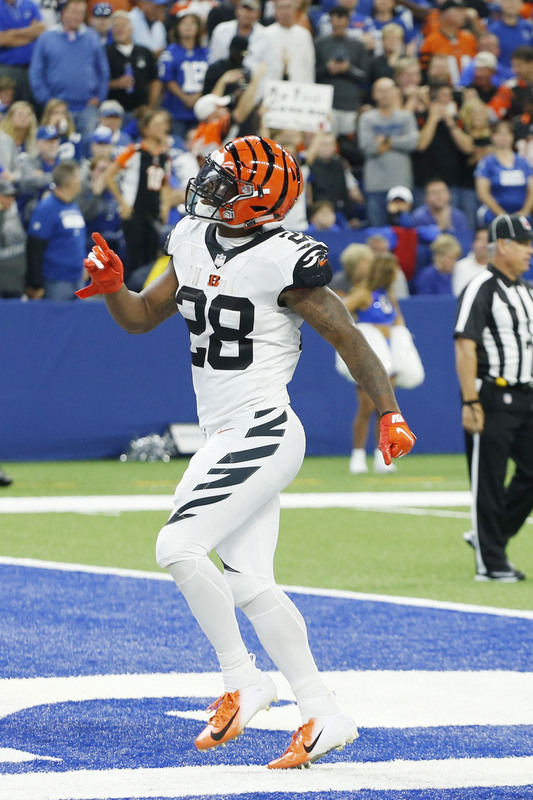 Joe Mixon missed part of Thursday night’s game, and the Bengals fear he’ll have to miss more time because of the knee injury he’s now battling. The Bengals are concerned their starting running back will need to undergo arthroscopic knee surgery, Tom Pelissero and Mike Garafolo of NFL.com report (on Twitter). Mixon will seek a second opinion. While having a knee scoped is not a season-ending development in most cases, it almost certainly would cause the second-year back to miss time. Mixon’s off to a good start, averaging 4.7 yards per carry, and it’s helped the Bengals to a 2-0 record. Mixon missing games would mean plenty of Giovani Bernard snaps. While the longtime Bengal is not a traditional between-the-tackles grinder, he’s in his sixth season with the team and now resides as the unquestioned top backup after Jeremy Hill‘s free agency departure. Behind Bernard sit fourth-round rookie Mark Walton and third-year UDFA Tra Carson. Neither has recorded an NFL carry. Just as Bengals running back Joe Mixon was beginning to get comfortable with the NFL game, the team has officially ruled him out for rest the team’s Monday night game vs. the Steelers with a concussion. The rookie running back took a big hit from both sides and was down on the ground for awhile until he was able to walk off under his own power to go through testing on the sideline. 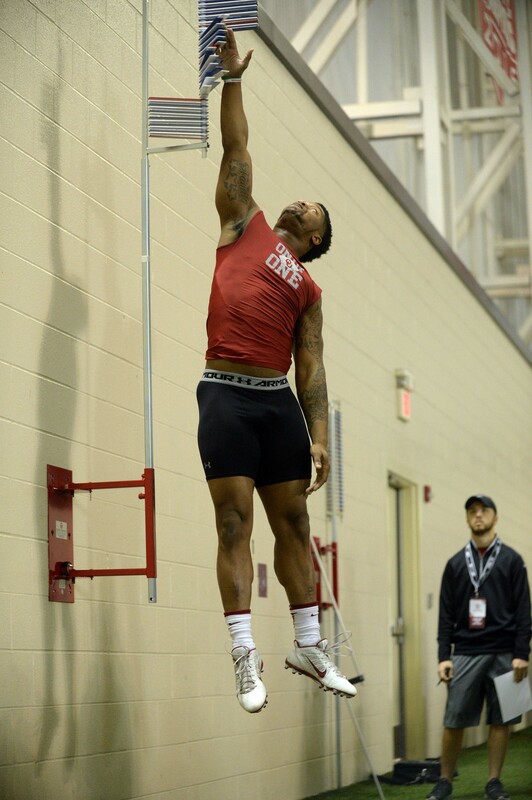 Mixon, 21, had started off his NFL career fairly slowly given his lofty status coming out of the draft. Many experts speculated that the former Oklahoma Sooner was just as, if not more talented than top backs like Leonard Fournette, Christian McCaffrey and Dalvin Cook. However, Mixon had just rushed for his first 100 rushing performance last week in a win over Cleveland and was just starting to show that immense potential many thought he had coming into the 2017 NFL Draft. The primary reason why the Bengals were able to nab him in the second round was due to off-the-field concerns stemming from an assault he committed back in 2014. Cincinnati will be on a short week after appearing on primetime tonight, so it remains to be seen whether Mixon will have enough time to recover from the injury for the team’s Week 14 game against the Bears. There was a team-wide brawl that took place between the Raiders and Broncos this afternoon, started by Raiders wide receiver Michael Crabtree and Broncos cornerback Aqib Talib. The two have a had a go of it in the past, when both engaged each other during a game last season. However, this fight was capped off by Crabtree throwing and partly landing a punch at the head of Talib. Both players were immediately ejected from the game, which forced the veteran wideout to watch the rest of the contest from a suite, according to Paul Gutierrez of ESPN.com. The Raiders receiving corps took a further hit in the AFC West battle as they lost Amari Cooper for the game with a concussion, Gutierrez also passes along. The 23-year-old wideout suffered the injury when he was hit in the head by Broncos safety Darian Stewart on a collision over the middle of the field. There appeared to be no malicious intent behind the play, even though there was a personal foul penalty given. Nevertheless, Oakland may be without both their top receivers for next week’s game because of what transpired today versus Denver. The Raiders would need extra contributions from the likes of Seth Roberts, Johnny Holton and Cordarrelle Patterson should Crabtree get suspended and Cooper not pass concussion protocol. The Jaguars were hit with a concussion of their own as starting linebacker Telvin Smith did not return after suffering the injury, reports Michael DiRocco of ESPN.com. Smith has been one of many key contributors in what has turned into perhaps the best defense in football. This situation will certainly be worth monitoring throughout the upcoming practice week. Bengals running back Joe Mixon had the best game of his professional career in the team’s blowout of the Browns. The second round pick tallied over 160 yards from scrimmage, while averaging exactly five yards per carry. 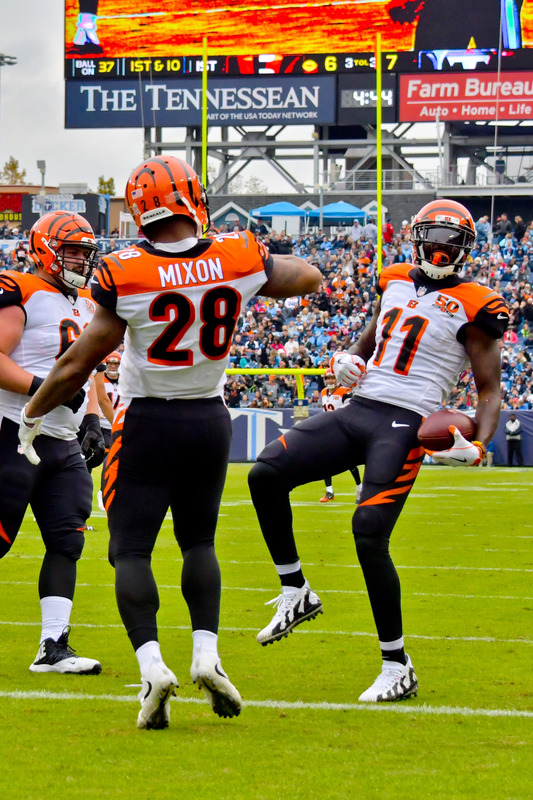 Mixon had already been getting a lot of work in recent weeks, but finally broke through with a performance that he and the team were waiting for. 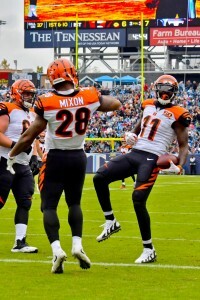 “It feels great,” said Mixon, “The offensive line was great and the receivers did a great job blocking on the perimeters and we just went out and finished.” (Quote courtesy of Geoff Hobson of Bengals.com). Look for Mixon to continue to be a big part of the Cincinnati offense in the last five games of the season. In other Bengals news, backup quarterback A.J. McCarron was seen mingling with Browns head coach Hue Jackson and owner Jimmy Haslam before Sunday’s game. This is notable considering Cleveland tried to trade for the signal caller right before the deadline, but it’s not something that McCarron really focused on when discussing the interaction after the contest. “No point talking about the trade. It didn’t happen and it’s not going to happen now,” McCarron said. “I saw Mr. Haslam just to say hey to him. I’ve known Mr. Haslam through the whole draft process. I took a visit there. He’s a good Tennessee guy and you know the love between Tennessee and Alabama.” (Quote courtesy of Hobson). In an interview with “Boomer & Carton” of WFAN on Thursday, Giants wide receiver Brandon Marshall indicated that he requested his release from the rebuilding Jets in March because they’re not going anywhere in 2017 (via Brian Costello of the New York Post). “For me, I just knew I couldn’t be in that environment,” said Marshall, who holds the unfortunate distinction of being the league’s current longest-tenured player without a postseason appearance (11 years). “I think everyone knows the type of personality I am at this point in my career. I wouldn’t have made it through an entire season knowing that we didn’t have a chance. That’s all you want as a player — you just want a chance.” Long after they cut ties with Marshall, the Jets released fellow veterans Eric Decker and David Harris in June. Marshall took exception with the timing in both cases, arguing that “it was too late in free agency” and calling the Jets’ maneuverings with Decker and Harris “bad business.” Harris’ agents made it known after his release that they were unhappy with the Jets, but the 10-year veteran did end up latching on with the reigning Super Bowl champion Patriots just over two weeks later. Toward the end of May, Broncos general manager John Elway expressed confidence that he would sign a contract extension by the start of the season. No agreement has come to fruition in the month and a half since, but the Broncos and the contract-year executive “have maintained dialogue recently,” reports Nicki Jhabvala of the Denver Post. Given that there’s no deal yet for Elway, the assumption is that discord or tension exists between the two sides, writes Jhabvala, but a team source shot down that notion. Joe Mixon is officially a member of the Bengals. The team announced that the running back has inked his four-year rookie deal. From a talent perspective, Mixon was one of the best running backs available in this year’s class. However, his baggage dragged him further down the boards of several teams and completely off the board for some. Mixon, of course, was caught on video striking a woman while on campus at Oklahoma. Mixon and the woman reached a civil settlement one week before the draft, but that was not enough to quell the concerns of teams around the league. Ultimately, the Bengals took a chance on Mixon at No. 48 overall. Without the off-field concerns, Mixon would have been a mortal lock for the first round. In 2016, Mixon rushed for 1,274 yards and ten touchdowns on the ground for the Sooners, adding another 538 yards and five scores in the passing game. Mixon is the ninth of the Bengals’ eleven draft picks to sign. Third round defensive end Jordan Willis and fifth round offensive lineman J.J. Dielman are the remaining stragglers. 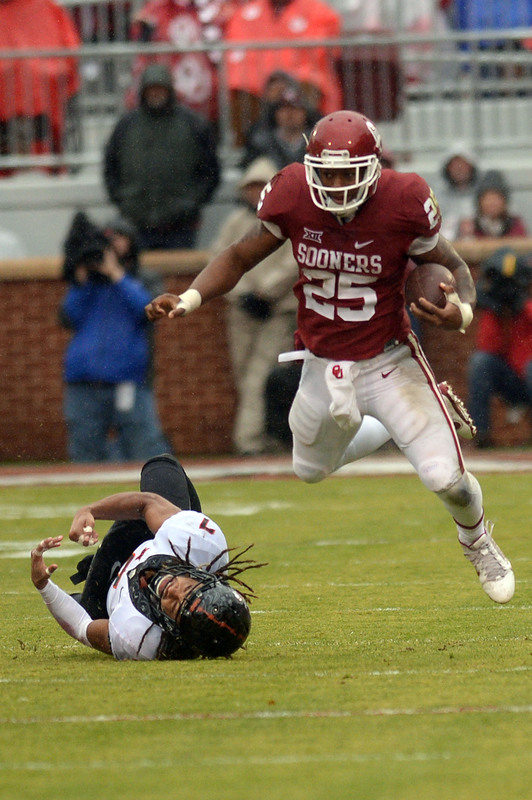 The Bengals recently made Oklahoma running back Joe Mixon the No. 48 overall pick of the 2017 draft, a move that predictably sparked a great deal of conversation and controversy. Mixon’s assault of a female Oklahoma student several years ago caused a number of teams to remove him from their draft boards completely — a recent report indicated that only four clubs said they would consider drafting Mixon — and any team that did select him knew it would have to contend with significant public backlash. Cincinnati, no stranger to taking a chance on players with character concerns, decided to take the plunge in the second round of the draft. Jeremy Hill and Giovani Bernard are on the Bengals’ roster, but neither back reached the 4.0 yards-per-carry mark last season, Hill will be a free agent next offseason, and Bernard is coming off a serious injury, having torn his ACL in November. So Mixon, who was perhaps the most talented back in this year’s class, made sense from an on-field need and value perspective.